Our Photos of the Week this time feature 2 examples of tobacco barns taken from the CD-ROM companion to John Michael Vlach’s 2003 book Barns (Norton/Library of Congress). The book and accompanying disc feature black & white photos of barns across the U.S., taken by a variety of photographers, and currently housed the Prints & Photographs Division of the Library of Congress. The photo above shows an air-cured tobacco barn in Lexington, KY and was taken in 1940 by Marion Wolcott. 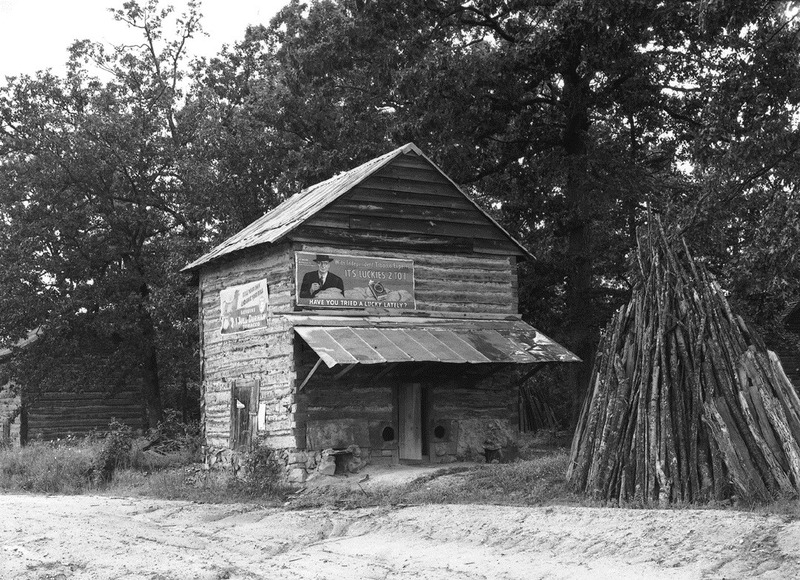 The one below shows a flue-cured tobacco barn (with advertising for Lucky Strike) near Gordonton in Person County, NC. It was taken by Dorothea Lange in 1939. Flue-cured tobacco barn, Person County, NC. Dorothea Lange, 1939. From the Prints & Photographs Division of the Library of Congress. The Barns CD-ROM is now available at the Southern Folklife Collection as call # CD-11794.